Welcome to the autumn edition of Holidays with Kids, packed with plenty of kid-friendly encounters across the globe. Upon Australian shores we venture to Queensland to explore the delights of its outback and tropical northern coast before checking out the All Stars of the Red Centre, the historic charm of Ballarat, all the action of western Sydney and a trove of caravan and camping inspiration from the Murray River to Treasure Island. 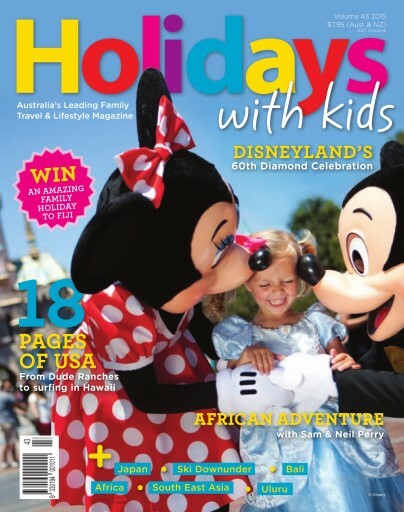 Our international section features a bumper section on the USA, stretching from the magic of Disney to dude ranches, road trips, national parks and the lights of Las Vegas. We also enjoy a trip to Africa with Samantha and Neil Perry, a trip to South-East Asia with Andrew Daddo and his family, and explorations of Bali, Japan, Portugal and Fiji. There’s even a family holiday to Fiji (valued at over $7500) up for grabs!